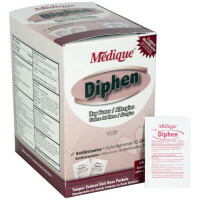 Purchase over the counter antihistamines here. Antihistamine medications provide comfort & relief from upper respiratory allergy and common cold symptoms such as sneezing, runny nose, itchy watery eyes, and itching of the nose or throat by reducing the effects of natural chemical histamine in the body. 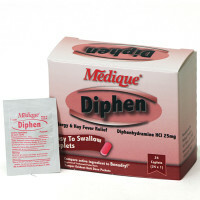 Try Diphen Antihistamine Capsules - like the name brand version, Benadryl, Diphen are used to treat all of the symptoms above including hay fever, hives, skin rash, itching, and even used to treat motion sickness, to induce sleep, as well as to treat certain symptoms of Parkinson's disease. Allergies? Itching? Sneezing? Rashes? Over-the-counter (OTC) Antihistamines help relieve or prevent allergy symptoms and you can buy them without a prescription from your doctor. They treat allergies, hypersensitive reactions, and colds. Your body releases histamines when your body is exposed to allergens. Histamines attach to the cells in your body and cause them to swell, and leak fluid. In turn, your body reacts with allergy symptoms such as itching, sneezing, runny nose, and watery eyes. Antihistamines prevent histamines from attaching to your cells and causing these symptoms. Your source for first aid tablets and over the counter medications for your safety kits, products, and supplies - Antihistamine. Wholesale to the Public Manufacturer Direct Safety Product Sales since 1993.